Epotec has been used on a wide range of commercial and community pools over the years. Here is a selection so you can see some of the more interesting projects, where Epotec was selected as being the best answer. Epotec is available in a light blue called SKY. If provides a soft blue colour in most conditions as you can see here. Bondi is a mid blue colour and is the most popular colour for Epotec by a long way. It gives a good colour depth without being too dark. 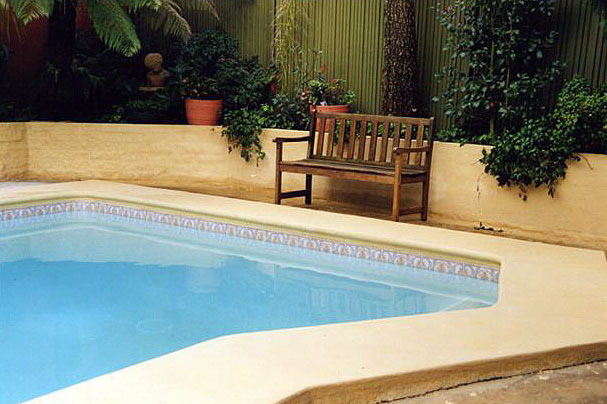 Most commercial and community pools are coated in Bondi Epotec. Tasman is a dark blue and is ideal for when seeking a more definite blue. It works well with any red - brown colours around the pool. (pavers etc). This is the second most popular colour. Slate grey is dark grey and gives a bluish result on sunny days. It can be quite gloomy on overcast days however. Pale Jade creates an intersting result being a blue - green colour. On bright days it is like the coral sea. White gives a blank pallete and it will provide colours as a result of overhead conditions and the depth of the pool. As can be seen from a clear white to a mid blue. Epotec in Chamois looks unusual being a yellow. But when filled it will give a bright greenish shade as it gains blue from the sky above. It suits a tropical garden concept well. Aqua is a pale version of Pale Jade and provides a more subtle result. Whisper grey is for when a hint of grey will do. It leaves a cool blue colour generally. Black will either gain your admiration or you won\'t go there. Can give a range of impressions depending on lighting, angle of viewing and depth of pool. Epotec is available in a range of other colours and here are some examples of it use.